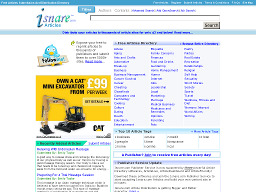 iSNARE.com iSNARE.com is an articles directory that provides marketers/ authors/writers and their articles maximum free exposure. Authors also can have their articles submitted to a network of 13,000 publishers and website owners can choose to use the site's RSS feed. 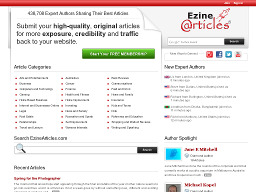 EzineArticles.com EzineArticles.com is another articles directory with over 15,000 articles in more than 20 topical categories. The site also offers a discussion forum and blog. ArticleAlley.com An easy to navigate articles directory with thousands of articles in 30 major categories. The site has some nice features, including latest posts and most popular authors. ArticlesFactory.com An article directory and search engine for readers to explore and authors to submit to. Could use a few helpful features but on the whole, not bad. 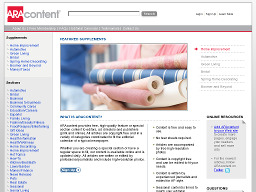 ARA Content Was setup to provide free content to the online media. However, registration is free, and there is nothing to prevent you from using the large collection of copyright-free articles and images at ARA to enhance your own web site. Whatis.com A knowledge exploration tool about information technology, especially about the Internet and computers. It contains over 3,000 individual encyclopedic definition/ topics and a number of "Fast Reference" pages. The topics contain about 12,000 hyperlinked cross- references between definition-topics and to other sites for further information. 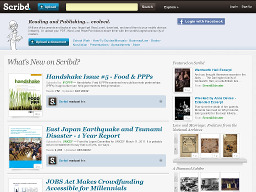 Scribd.com A site where you can publish, discover and discuss original writings and documents. The site has one of the largest readerships in the world. Scribd's iPaper document reader allows anyone to easily upload and share their work on Scribd.com or any other website. Provides a creative and useful new platform for readers, authors, publishers and anyone else seeking to express themselves, share ideas and exchange information. 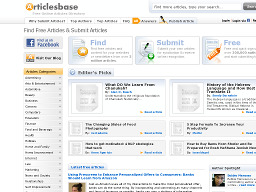 ArticlesBase.com An up and coming articles directory with over 13,000 articles written by more than 3,600 authors. Has the usual features - most viewed, recently submitted, etc. ArticleSphere.com An online fr'ee article directory that allows writers / authors to feature their articles, and publishers / webmasters to search for quality articles for reprint. 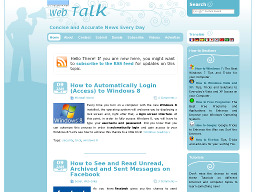 WebTalk Offers concise, brief, accurate and verified news on a variety of tech topics. Over 2,000 articles in 20+ categories, ranging from Apple and Microsoft to Web 2.0 and smartphones. Also, provides useful How-To sections. 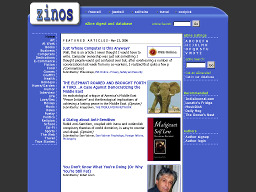 Zinos A digest of some of the best eZines on the web. 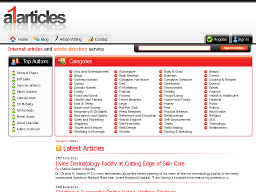 Also, an article directory with articles in numerous categories. 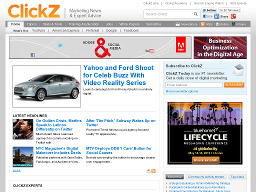 ClickzToday A newsletter and article site that provides daily articles on a wide scope of topics ranging from linking and advertising to email strategies and search engines. Great articles by great writers. Amazines.com A fr'ee article content and ezine database for publishers and webmasters. 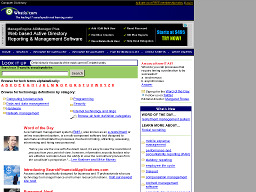 A1Articles.com One of the more popular and established article directories on the Web. Launched in 2004 and part of an article directory network comprised of 8 sites. SooperArticles.com An article directory and search engine that is rapidly growing in popularity. Well designed with all of the features expected of a good article repository.